One of the biggest questions that people ask upon discovering Rock Lords was "did they make any other episodes apart from the movie?" The answer is, of course no. Apart from when they did. 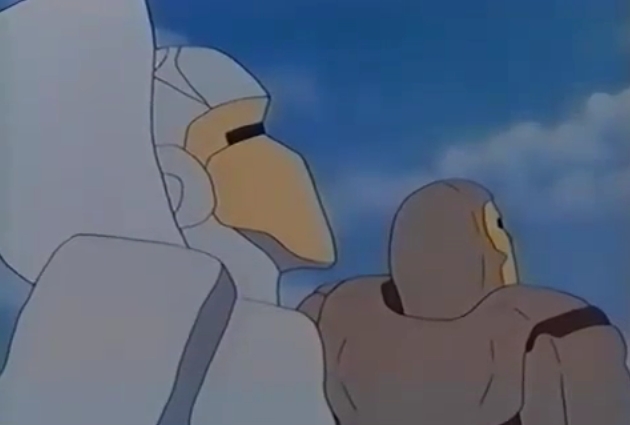 You may be familiar with the Japanese anime 'Machine Robo: Revenge of Cronos', which featured the Rock Lords and was even broadcast in France under the title 'La Revanche des Gobots' (Revenge of the Gobots), apparently dubbed as a direct continuation of the Hanna-Barbara Gobots show... somehow. When I was told about a French Rock Lords cartoon, I assumed it was this that was being referred to. Hold onto your hats, because your mind is about to be blown. The Rock Lords also appear in an official capacity in the 1986 French cartoon 'Bleu, l'Enfant de la Terre' (Blue, Child of the Earth). 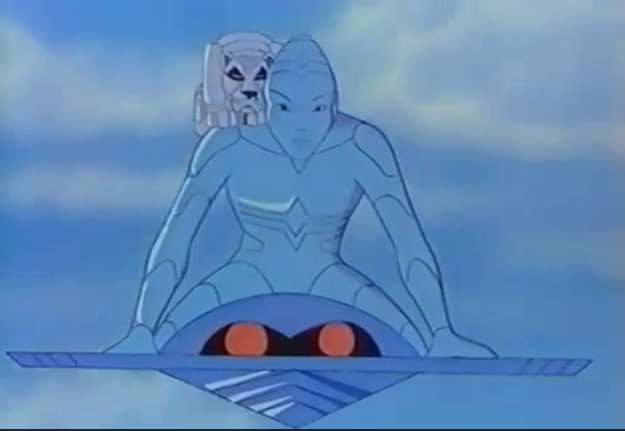 This was a 13 episode 26-minute cartoon about a blue man flying about on a hover sled (pretty much the Silver Surfer) in a post apocalyptic world. 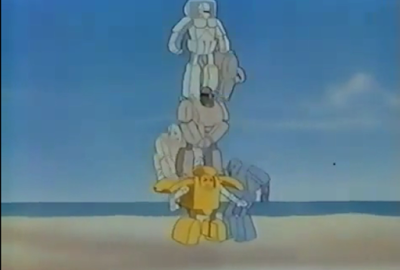 The production company IDDH had a deal with Bandai, and so forced the producer to put Rock Lords in it in order to push the new line of toys (the Rock Lords movie was released in the UK/US in early 1986, I don't know when the French release date was). Apparently this upset the creator, Philippe Druillet who is a serious artist, not a man who sells out! He was keen to control every aspect of the show to fit his vision, which sadly transforming plastic rocks did not fit into. 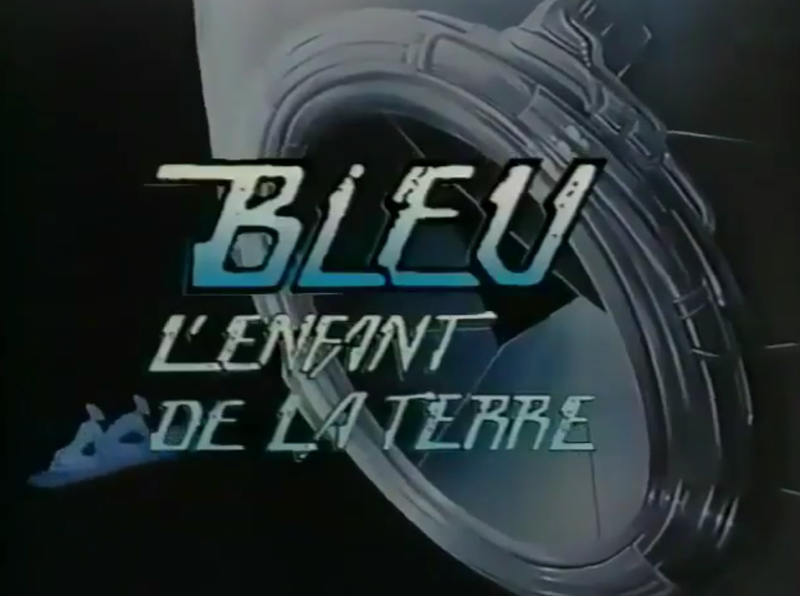 The show was originally supposed to have 26 episodes but this was cut to 13, and due to a tumultuous production was eventually broadcast four years later, in 1990 on Canal+ (this is all the information I could find about the production, let me know if you have any more!). I only have access to the first episode, but be in no doubt: these are Rock Lords. 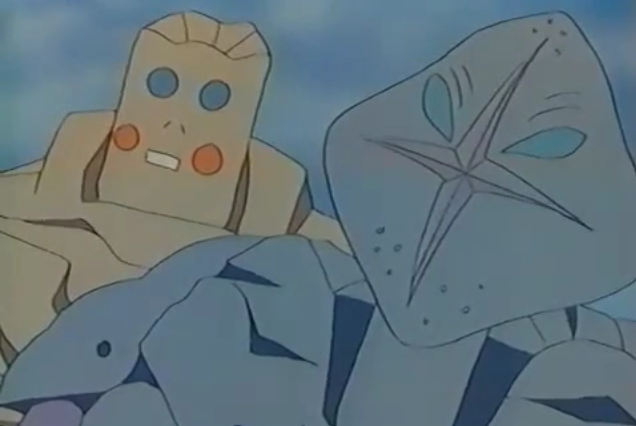 They use the same designs, same transformations and characters even refer to them as Rock Lords. It was officially endorsed by Bandai. This is a real thing that actually happened! The first episode focuses on them quite a lot, though in a disposable way - half of the episode is them happily playing on the beach before the plot kicks in and they run away, leaving Blue to save the day. The history of this show gets even more exciting, as it turns out that it was dubbed into English, broadcast on Nickelodeon (or one of its precursors) in the UK. Don't believe me? Take a look at the UK opening (sadly there are no Rock Lords in it!) 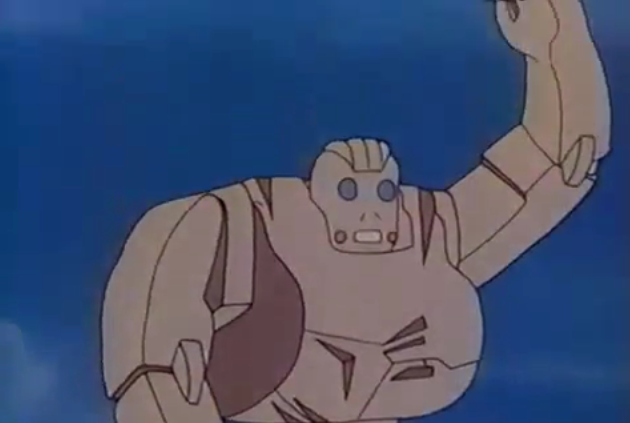 Videos of the actual English dubbed episodes haven't surfaced, but it would be fascinating to see if they were called Rock Lords in that as well! Below, we'll look at the first episode. It will get picture heavy, but I'm sure you're all as excited as I am to see these Rock Lords in action! Episode one is called 'The Black Galley' and is a straightforward affair, with plenty of Rock Lords. 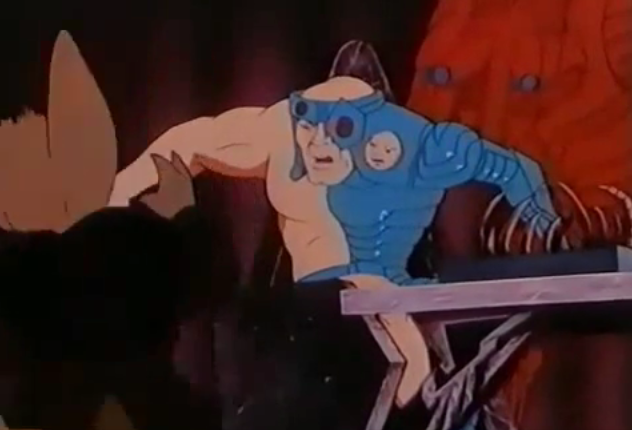 It opens in the lair of one of the villains, who is a naked cyborg with a little baby head attached to his face. This is all well and good, but more exciting than that is who his friends are! 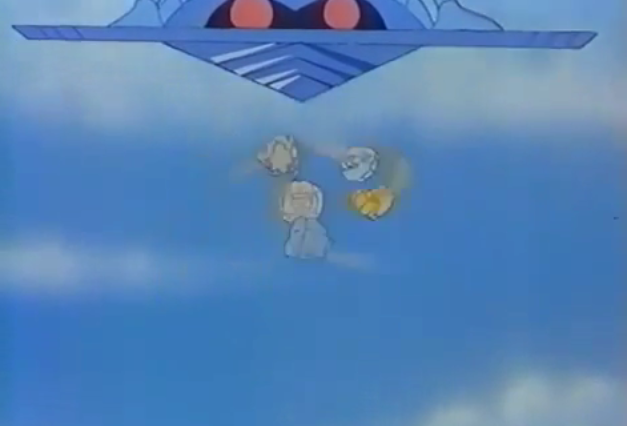 There is a long sequence where his comical minion is chased around by a very angry, tiny floating Brimstone. 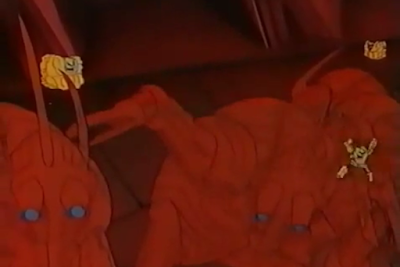 The villain has an army of large red robotic creatures. I don't recognise these - are they original or are they other Bandai figures that are being advertised? Brimstone himself is tiny and floats about in the air, waving his arms and legs angrily. Interestingly he is yellow, not read. 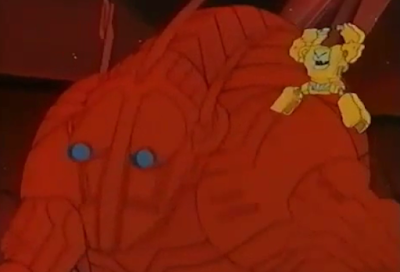 We'll see later that the other Rock Lords are very close to the original designs which begs the question as to whether Brimstone was originally going to be released in yellow. Each of the big robots has their own little Brimstone floating besides them. 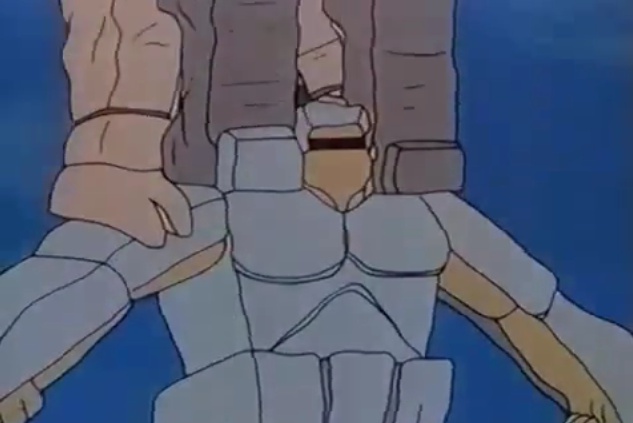 The animators use the fact you can see his face in rock mode to good effect here. It's nice to see the care that has gone into the animation model - it is very clearly based on the toy to the extent that it has the same hollow areas in the legs that allow it to transform! 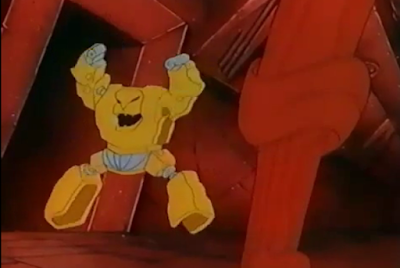 Brimstone transforms into rock mode and flies after the comical minion, eventually getting caught in the naked cyborg's hand. 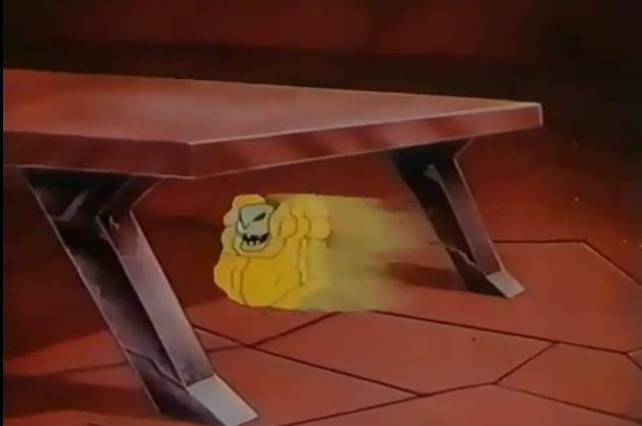 You can see by the scale of the table how small Brimstone is - all the Rock Lords are around the size of a fist. It is also worth noting how scary Brimstone looks flying about like that! 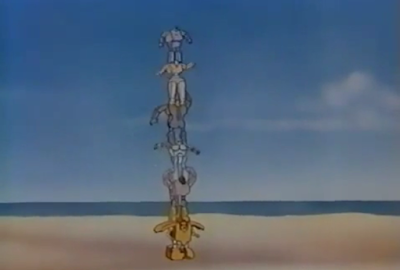 The story then moves onto a long sequence on a beach. A very long sequence in fact - it lasts about half the episode and is pretty much just the Rock Lords having fun. 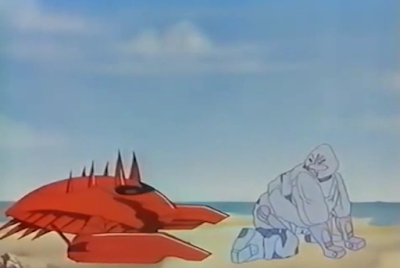 Here we see Crackpot tripping over a crab. The blue character is one of Blue's (the title character) people. 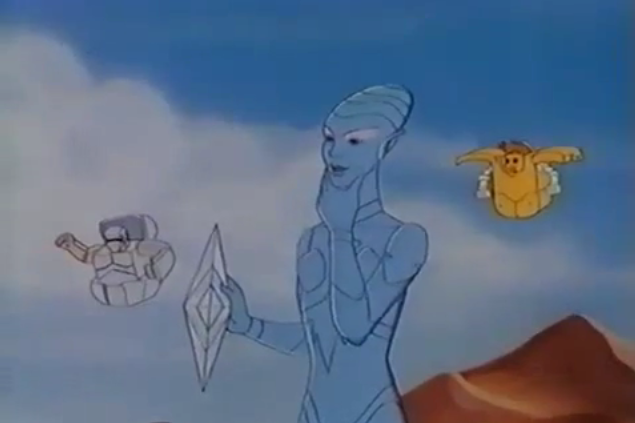 She is playing catch with the Rock Lords. 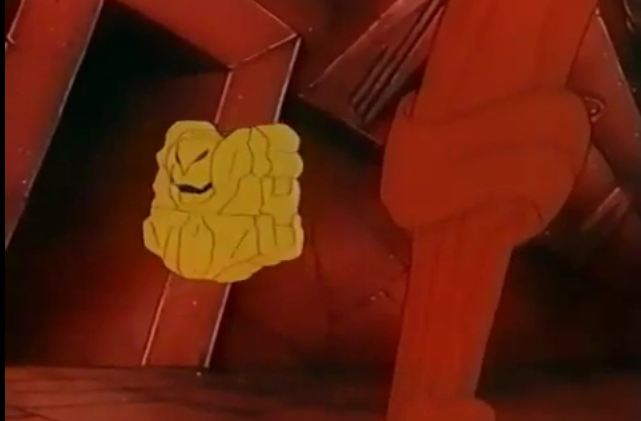 Like Brimstone, they can fly in rock mode, but here they half transform to do so. Boulder and Nuggit are seen above, and their toys can actually fit into those transformations! 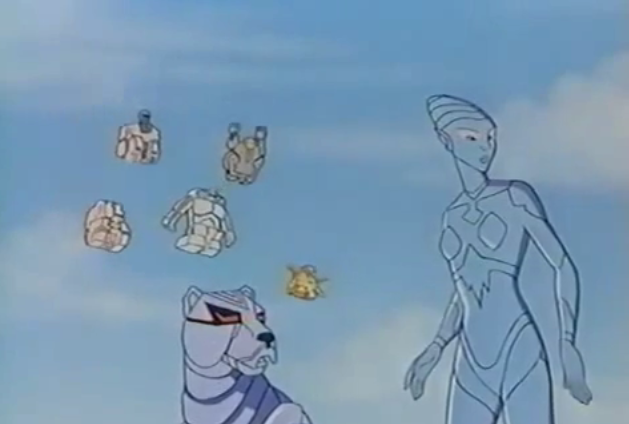 The game of catch is also played with a lion from Voltron (no seriously it is, as we'll see later), showing that Bandai were determined to give the viewers the best value for money and upsetting the creative vision of the show even further. Above are Pulver-Eyes and Granite. Granite is consistently coloured with a yellow face here. 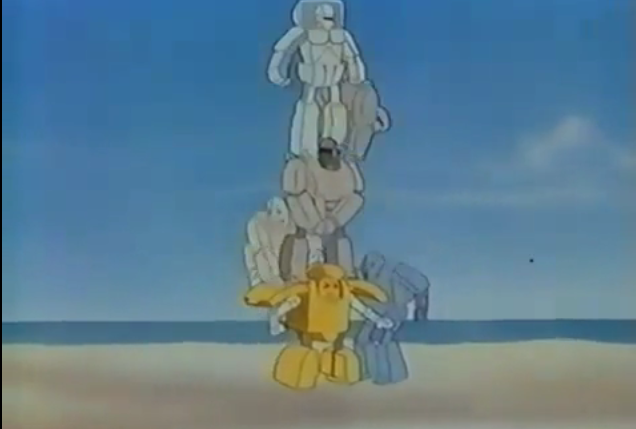 The Rock Lords decide to form a tower, and so we get a good look at them in a panning shot. Marbles. His skin tone is much closer to the Japanese version than the European reissue, though he does seem to be lacking his distinctive head shape and indeed, a face! Boulder. 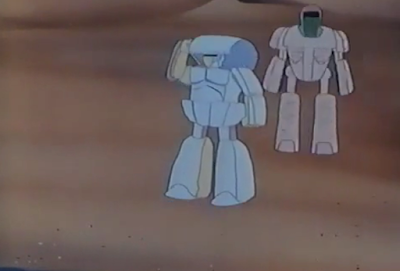 Like Marbles, he is lacking a face, and doesn't have his distinctive red helmet either. Pulver-Eyes. Pulver-Eyes looks adorable here. 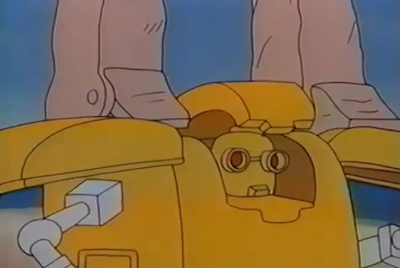 For some reason the animators have chosen to depict his orange pincers as rosy cheeks! 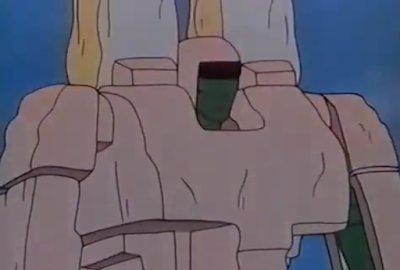 Crackpot reaches the top of the tower (sadly we don't get a panning shot of him, but he's featured heavily in the episode anyway). 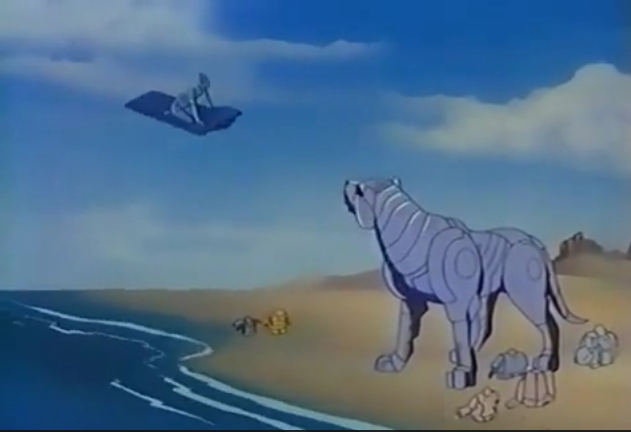 The Rock Lords do their half-transformation thing and fly about Voltron-lion's head. 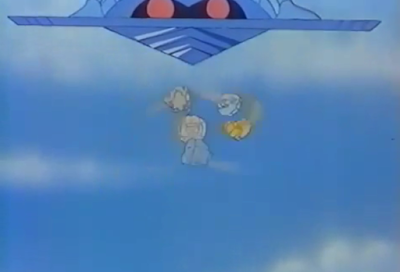 The characters eventually meet up with Blue, who has found Crackpot after getting hit by the ball. 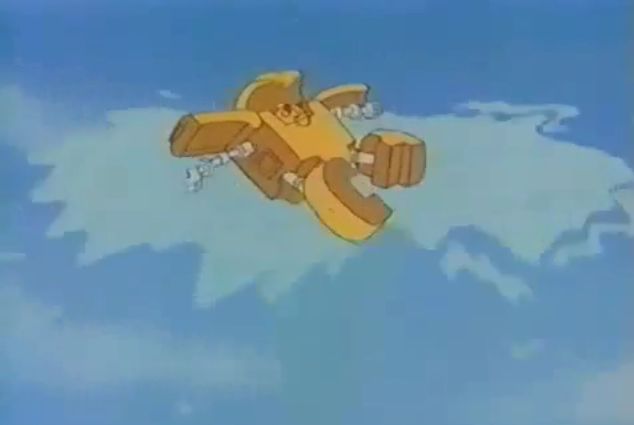 As an aside, I like Granite's flying mode with his arms stuck up. I read a forum comment recently by someone who said as a child he didn't have the Transformer Laserbeak, and would (for some reason) pretend Granite was Laserbeak. I like to believe this is how it was done! The plot suddenly kicks back in, and the half-naked cyborg with the baby face meets the big villain and gets some orders. 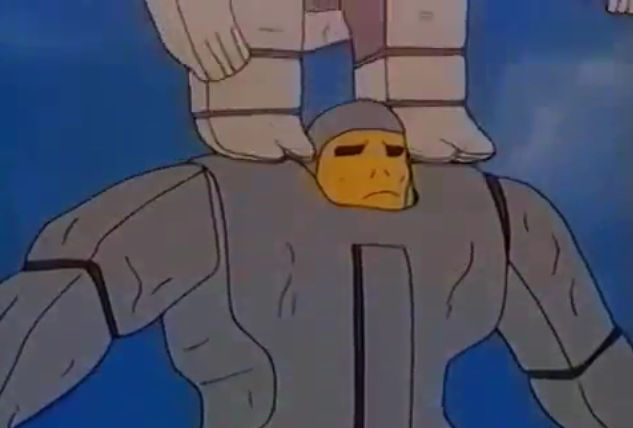 There's no Rock Lords content here, I just wanted to share the full horror of the above image. 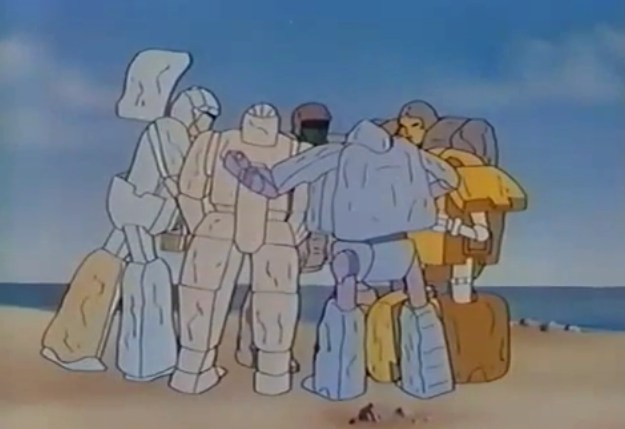 We're back into pulse-pounding action as the Rock Lords continue to play on the beach. 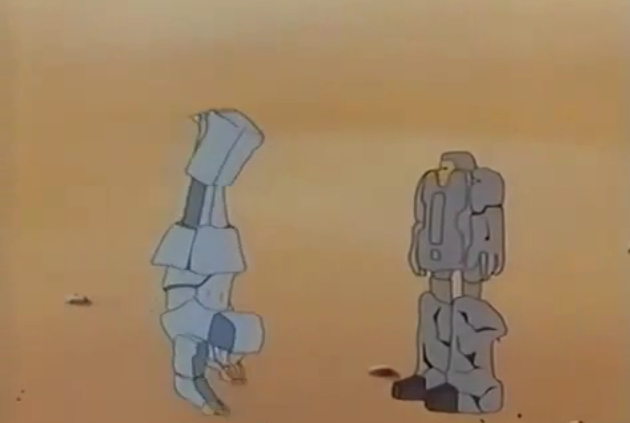 Boulder is doing a hand-stand. 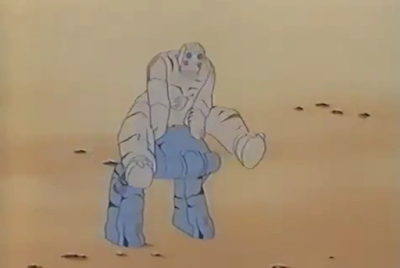 Pulver-Eyes and Marbles are playing leapfrog. Granite is watching Boulder do a handstand. Boulder and Granite watch Blue in the sky on his surfboard. 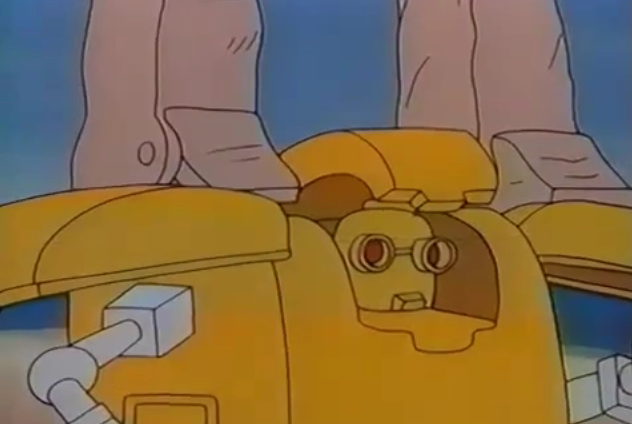 There's a cute bit as Boulder's hood keep flapping down over his face and he has to repeatedly push it up. 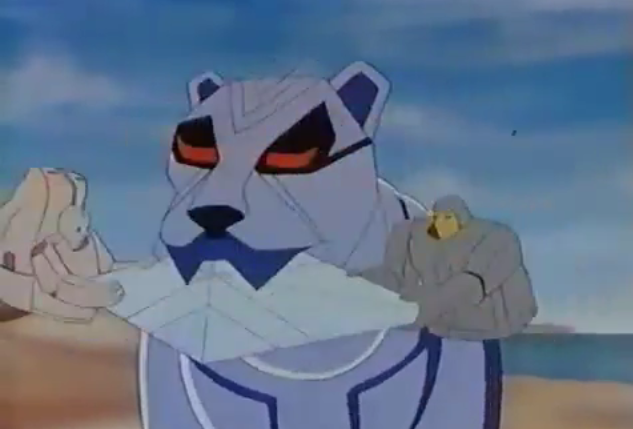 The Rock Lords are chilling with the Voltron lion. The plot actually kicks in properly now. The villain arrives and kidnaps the lady. 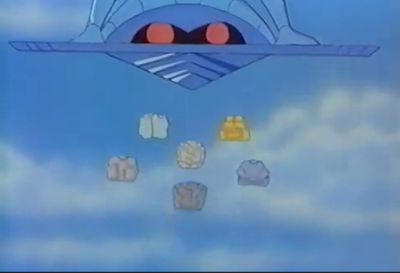 The Rock Lords all shake their fists at the sky and then turn into rocks and fly up. Boulder's hood keeps dropping down on his head. Blue flies off on his surfboard with Voltron lion to save the day. 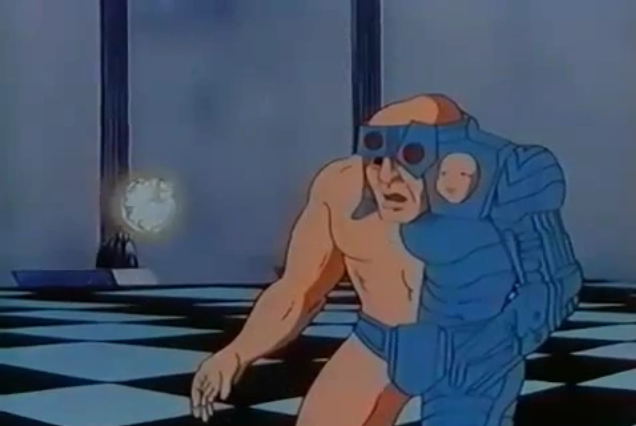 But something very strange happens to his Rock Lord pals which I'm really confused about. Is there anyone who speaks French who can help? 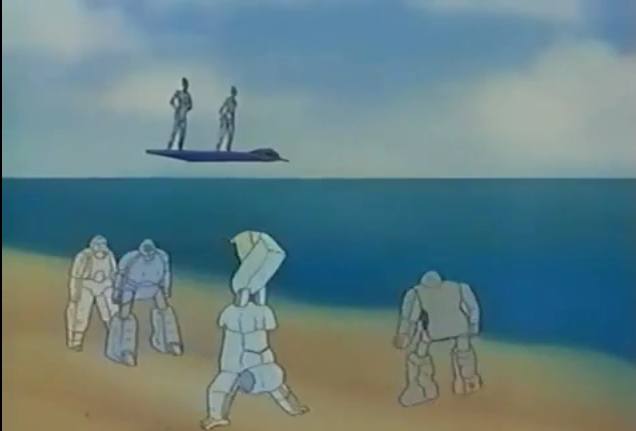 The Rock Lords fly up into formation below the surfboard. And turn into a ball of light! And promptly vanish from the action. The rest of the episode is pretty standard and unnoteworthy both in terms of plot and in Rock Lords content. 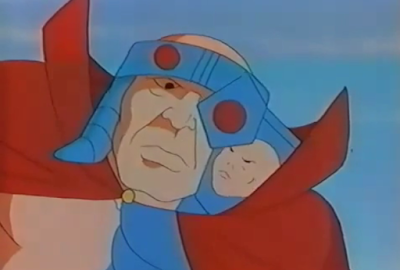 If you were wondering, Blue fights the naked baby-faced cyborg and saves the girl. There's also some blue ladies above who bear a striking similarity to Solitaire, though this may be a coincidence as they're normal-sized, not tiny. 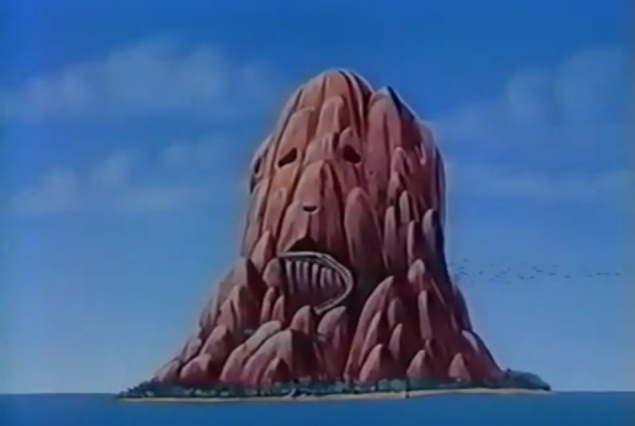 There's also a place that looks like it could be inspired by Stonehead, or just a coincidence. There is no Rock Lords content here, I just thought you'd appreciate that the naked cyborg gets himself a big red cloak. 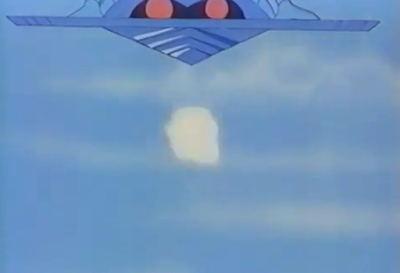 The day is saved, and our heroes fly back to find their Rock Lord friends playing with whales. Nuggit is floating atop a whale spout. And yes, see, it is a Voltron lion. Hands up who didn't believe me? 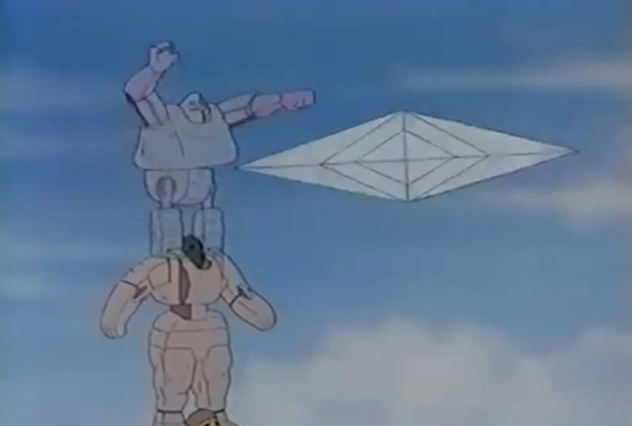 I hope this was an exciting glimpse into a Rock Lords cartoon that no-one really knew existed. While we don't see all of the Rock Lords, it's interesting that the good Rock Lords are hanging out with the good guys, and it's Brimstone that is with the villains - a coincidence or commitment to keeping the good/evil divide of the toys? 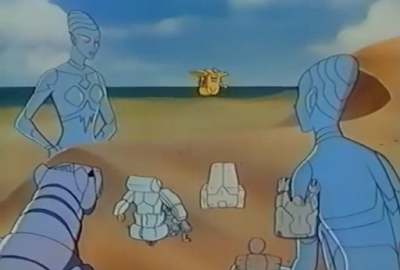 The Rock Lords clearly are nothing to do with the original vision of the show, and vanish as soon as the plot begins, but it does spend literally half the episode showing them playing and having fun. I like the idea of the Rock Lords being as small in real life as the toys are - it's a completely new vision for Rock Lords that has become lost in obscurity. Do you remember this show? Did you see it when it was broadcast in English? Do you have access to any of the other episodes and can shed light into their Rock Lord content (if any!) Let me know! 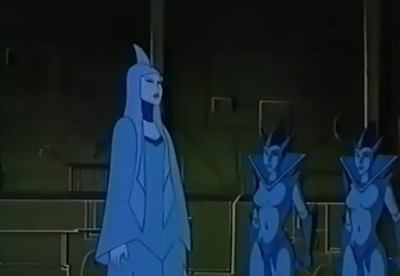 The idea that there was a unique French Rock Lords cartoon that no-one has heard of, featuring a main character called Blue... I really should have saved this for April 1st as a double-bluff! It's literally unbelievable!